Lutherans For Life | Who Are Lutherans For Life? Order LFL Membership Brochure - This full-color resource is a combination informational bulletin insert, membership form, and return envelope. 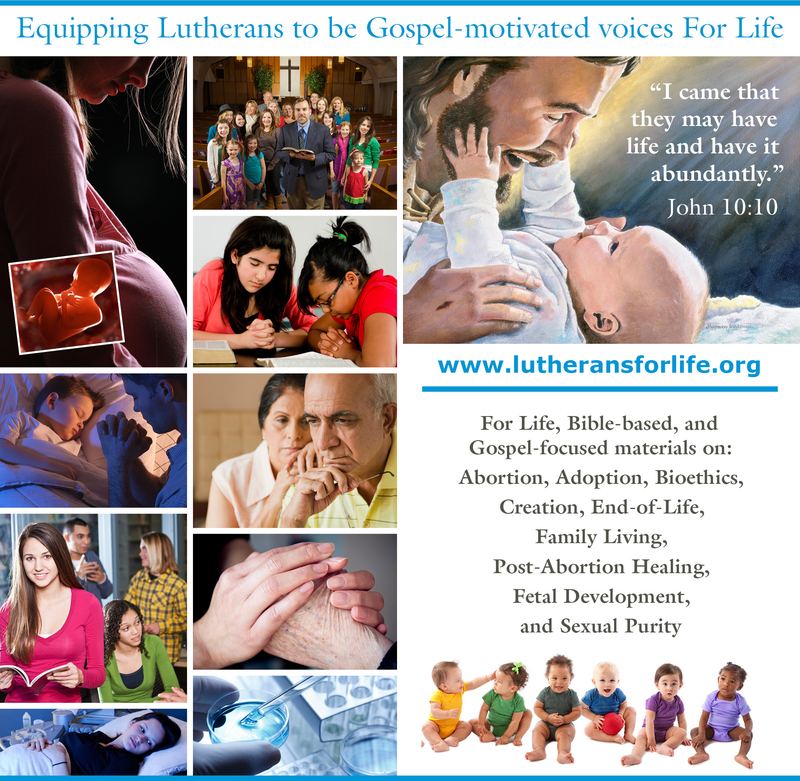 Lutherans For Life has a nation-wide network of state federations, chapters, and Life Teams. LifeDate, our free quarterly journal. Life Notes weekly e-newsletter. Sign up at the top of this web page. Life Quote are quotations on life issues—many from LFL resources and publications—for use in weekly congregational bulletins. You are also free to use the quotations in your monthly newsletter. Life Thoughts in the Church are designed to help pastors and congregations see the church year through the lens of the sanctity of human life. Life Thoughts are based on the appointed readings from Lutheran Service Book. Lutherans For Life members serve as volunteers in caring pregnancy centers, facilitate educational programs, aid hospice, and give witness to chastity before marriage and faithfulness in marriage. Lutherans For Life offers counsel, hope, healing, and reconciliation with Jesus Christ through Word of Hope (888-217-8679; www.word-of-hope.org) to women and men who are experiencing the aftermath of an abortion. Lutherans For Life seeks to change hearts and minds through the Word of God, trusting that changed people will seek to change laws. Our prayer is that together we can stand for the value and dignity of all human life from the youngest to the oldest, the preborn to the elderly, the weakest to the strongest. Jesus said, “I say to you, as you did it to one of the least of these … you did it to me” (Matthew 25:40 ESV). May we see the face of Jesus Christ in all people. We are determined to energize and equip pastors and congregations, educators and schools, students and young people to help them understand and speak the truth of God’s Word. Jesus said, “I came that they may have life and have it abundantly” (John 10:10). We invite all Lutherans to help us Bring Good News to Life, to make the connection between the life issues and the Good News of Jesus. Instead of a “god of death,” we offer the Lord of Life as the one who rescues from sin and death and who gives the hope of His eternal presence.